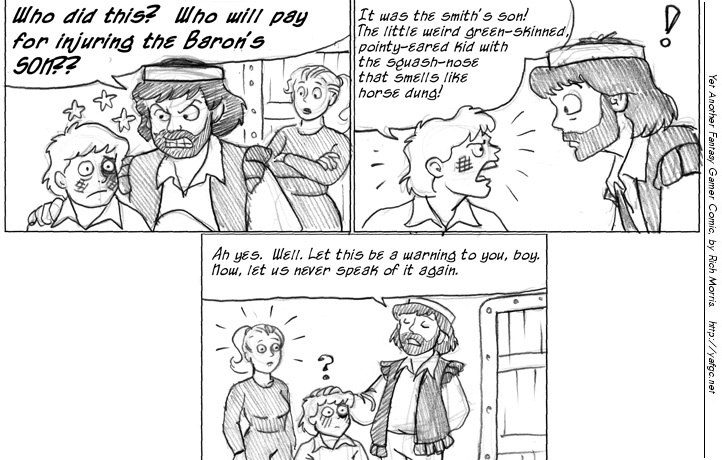 With this you might be suggesting that Baron knew exactly how Glon was related to him right from the start. He just "let" this half orc child stay in his kingdom..and not because it would be the safest place for an illegitimate child he can’t claim to live. And three strips that follow. Not the last time, either. Seems Lucas never DID learn. Actually, this may be the first time. The 112 definitely happened later than this. Of course. That’s what I meant — "this" referred to comic 112 I linked to. Obviously, this comic didn’t exist when 112+ was written and published, but it’s still funny how hard retroactive continuity is. It is getting a little cramped in there. On the other hand, maybe after this incident Lucas stuck with insulting only Glon and not any of his family. And like that C’rhynne makes a connection. Not necessarily. She specifically told him that Lucas picking fights with Glon was a problem. She could interpret this as him taking what she said into account and acknowledging it was Lucas’s fault. Which it <i>was</i> so this’d be a fair response without any connection between him and Glon. Maybe she’s just surprised that a baron is being fair in such a situation. Hey, the smith’s son did start it. The real son, that is. why I love this comic. Character Development! OK, it’s been two weeks now… Rich? are you OK? is everything fine? Or are you travelling and I just missed the note or something? I’m DYING to find out how this goes! Sorry! Yes, I’m fine, promise! I just had a routine for years and now I’m trying to reestablish one. I used to get my comics done at certain times and combinations of new job (I’m not sure how much of this is genuinely affecting my output as the work schedule is pretty much identical as before, but it’s disturbed my mental relaxation levels and I’m struggling to return to equalibrium), cascading holidays, trips and distractions has brought me to this point of missing two weeks of updates. I’m sorry about that. I should publish that as a supplement sometime. It’s pretty…extensive. Glad to hear you’re okay. Take all the time you need. Oh my goodness, would I ever love to see that YAFGC historical supplement! Consider this an emphatic "yes please" vote for one! Take all the time you need; never mistake enthusiasm for the next strip for a demand. Just glad that all’s largely well! Also? Add my YES! please! vote to the historical supplement. Thanks for letting us know you’re OK, and see you next week. And another enthusiastic yes from me for the supplement. Hello, I have just reached the last posted strip, I discovered this webcomic a few monts ago and i have been reading it since then (trying to ration the conten) and i have to say that i love it. The "realistics" characters and the long time this comic has been living is a real inspiration. Thanks Rich Morris, I realy love your work. Thank you very much! It’s so encouraging to hear posts like this, especially in situations like where I’m at right now, where I’m…. less inspired and inclined to weary. I have so much I still want to do with this world and these characters, but from time to time one tires, yknow? Thanks for this uplifting comment. It’s helped. Please, if you need to rest, do so. We’re so grateful for all that you have done. You have created an extraordinary world, filled with a wide variety of characters with depth, complexities, and soul. And you do all this incredible work in your spare time while trying to balance it with a full time job and caring for your family. Please, pace yourself, my friend. We can wait. Yes, we’ll wait. Another yes for the supplement.